A general HCU was conducted on 27th May 2017 at North Division DCP office of the Kolkata Police. On occation of the Road Safety Week, Fortis Hospital, Anandapur organized BLS Training session for 25 auto and bus drivers at the hopsital premises in association with Kolkata Traffic Police. In this session they learnt the way handle medical emergencies at the road. A health check-up camp was organized at Gobardanga, North 24, Parganas, in association with Bibekananda Seba Samiti and MCRWA. More than 200 people were screened during the health camp. A free health check-up camp was organized at Salt Lake Central Park. Free Blood Pressure Check and Random Blood Sugar Tests were done during the camp. A health talk was organized by Fortis Hospital, Anandapur, for the employees of Tata Consultancy Services, in which Dr Manish Ganguly was the keynote speaker. Dr Ganguly spoke on 'Thyroid Disorder'. A workshop on Risk Behaviour Management was organized for the students of class XI of Gokhale Memorial School for Girls. The workshop was conducted by Department of Mental Health and Behavioural Sciences. Fortis Hospital, Anandapur, organized a health talk on 'Joint Injuries – Prevention & Management' at the Zonal Office of Food Corporation of India. The talk was given by Dr Gaurav Gupta, Consultant, Orthopaedics & Joint Replacement. 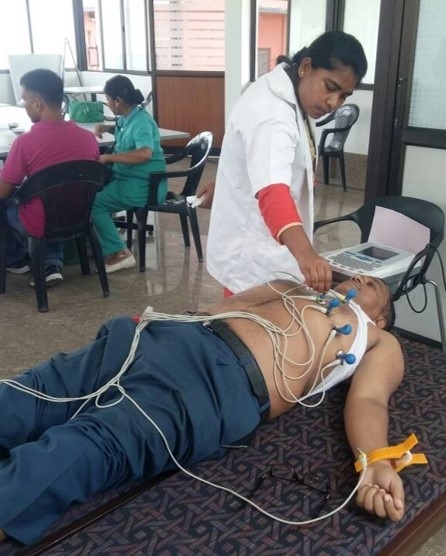 Fortis Hospital, Anandapur, organized a cardiac check-up camp for the members of Durgabari Puja Committee. A lot of people were screened during the camp for cardiac ailments. The camp was appreciated by members of the committee. A health check-up camp was organized by Fortis Hospital, Anandapur, for BSF personnel posted at Bongaon. The soldiers also participated in Fortis NDTV's 'More to Give' initiative and pledged their organs. Fortis Hospital, Anandapur, in association with NDTV, celebrated World Organ Donation Day at Salt Lake City Centre 1 Mall. The activity was aimed to sensitize people about the need of organ donation. More than 300 people pledged to donate their organs during the day. Fortis Hospital, Anandapur, in association with World Alliance for Breastfeeding Action (WABA) organised a workshop to mark ‘WorldBreastfeeding Week 2017'. The program focused on teaching the importance of breastfeeding. Workshop on Risk Behaviour management was conducted by Dept. of Mental Health & Behavioural Sciences at Fortis for the high school students of Kolkata. 60 students from 12 leading schools participated in the workshop. A General Health Check-up camp was conducted for the community residing at ward no 1 in Kamarhati. A general health check-up camp was organized for the employees of Jet Airways posted in Kolkata. Dr. Gaurav Gupta imparted a Health Talk on Sports Injuries in presence of sports coach and doctors at Dhanbad. Health Talk was followed by some chedck-ups for the Arthroscopy patients by Dr. Gupta. A general Health Check-up camp along with PFT was conducted for the underprivileged community of Mangalkot in Burdwan. Health Check-up camp and BLS workshop conducted by Dr. Tanmoy Chatterjee from Emergency Department at Barasat. A general HCU camp was organized for the Kolkata Police personnel posted at Thakurpukur Police Station. General Health Check-up camp was organized for the members of COLORS – A Facebook Community. 100 enthusiastic members had their health check-up done. Health Talk on Low Back Pain was conducted at Tata Motors Plant at Jamshedpur. Dr. S K Mishra (Neuro & Spine surgeon) and Dr. Rakesh Rajput (Ortho surgeon) from Fortis Hospital, Anandapur interacted with the employees. A general HCU camp was organized for the community was organized at Airport Housing. A unique workshop was organised for children at Asansol Club by Consultant of the Dept. of Mental Health and Behavioural Sciences at Fortis Hospital Anandapur. A general HCU camp was organized for the employees of Canara Bank. Cardiac HCU camp was organized at 6 Palli Club at Dum Dum Road. An Organ Donation awareness talk was also also shared with the club memebers. A unique workshop was organized for kids of Fortis employees and doctors by the Dept. of Mental Health and Behavioral Sciences at Fortis Hospital Anandapur. Fortis Hospital, Anandapur in association with Rotary organized a Mega Ortho camp at Avishkar Diagnostics in Dhanbad. Screened positive patients were seen by Consultant Orthopedic, Dr. Rakesh Rajput. A health talk was conducted by Dr. Priyam Mukherjee at FCI Zonal office. A BLS workshop was conducted at Level 10 at our hospital with community members from South Dum Dum Soccer Club. Organ Donation forms were also filled by the participants. Sunday Conversation on Sports Injury was conducted by Dr. Gaurav Gupta for the members of South Dum Dum Soccer Centre. A general Health Check up was conducted on 27th May 2017 at Airport 1 no. gate in association with Dum Dum Sikha O Sanskriti. People really appreciated the initiative taken by Fortis. A cardiac CME was organized by Fortis Hospital, Anandapur at Jamshedpur where Dr. K.M. Mandana. The topic was “Heart team Approach for Complex Cardiac cases “. A CME was organized by Fortis, Anandapur in association with RMP association 24 pgs (N) by Dr. Tapas Roychowdhury. Total participants were 29. A corporate visit and Health Talk was delivered by Dr. Shhuvanan Ray at DVC, Kolkata on 23rd May 2017 on ” Healthy Heart “. A Health Talk was organized on Stress management at Zenith Leisure Holidays Ltd Kolkata. The activity was really appreciated by the participants. A HCU camp was held on 19th May with Kolkata Police 2nd battalion. Police personnel thanked the Fortis team for organizing the basic health check-up camp. World IBD day was observed at Fortis Anandapur. Symptoms of IBD was shared by Dr. Debasish Dutta with the other speciality doctors. Highlight of the event was a talk by Mrs. Mala Neotia speaking about her fight with IBD and thanked Dr. Dutta for helping her lead a normal life. An orthopedic clinic was held at Dhanbad on 18th May in association with Saidhela Chamber of Commerce. 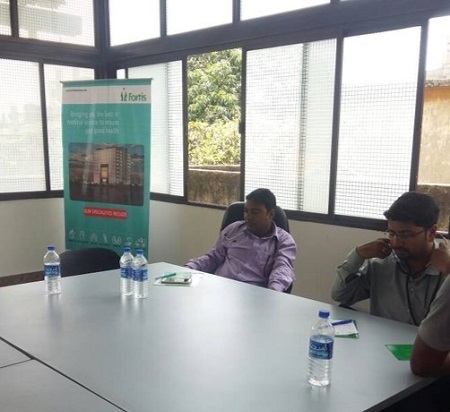 A ECG HCU camp was held at South Dum Dum Soccer Center along with MyFortis App promotion. Total 20 MyFortis app was downloaded during the activity and around 44 people got their health checked. An ECG screening camp was organized at Jamshedpur on 13th May 2017. Almost 60 patients got themselves checked. Fortis hospital Anandapur hosted patient reconnect session to increase awareness on Precautions and Preventions of Asthma on 9th May 2017. 20 patients participated in the activity and made it successful. A general HCU camp was organized at Bashirhat in association with SDO office Bashirhat and IRCS Bashirhat on 08th May 2017.182 lives were touched. A cardiac camp was organized at Shanti Scan, Uttarpara on 7th May 2017. Almost 60 lives were touched. A Cardiac Camp was organised at Ranchi in association with Jain Samaj on April 30, 2017. Approximately 187 people attended the camp. To observe immunization week Fortis in association with Calcutta Rescue ( NGO ) conducted Immunization program at Kolkata Garden Reach. Dr. Nicola Flynn gave a health talk to the underprivileged community on “Importance of Immunization”. A general HCU was conducted at ICAI Park Street branch on 26th April 2017. 51 people participated in the activity and made it successful. BLS workshop was conducted with the health workers of the NGO – Calcutta Rescue. Total 22 members of the NGO attended the workshop. BLS workshop was conducted for the NGO – LP4Y(live projects for youth). Total 22 members of the NGO attended the workshop. Fortis participated in JIMACON 2017 where we registered around 160 doctors from all over West Bengal. The event was held on 15th and 16th April 2017 at the Oberoi Grand, Kolkata. Lunch was sponsored for the doctors on 16th April from Fortis. A Health Talk was organized by Fortis Anandapur on the topic Healthy Heart at PWC on 12th April 2017 by Dr. Prithwiraj Bhattacharya. Almost 30 employees participated in the activity. A general HCU camp was conducted by Fortis Anandapur from March 28 to April 2, 2017 at parks across Kolkata with the aim of reaching out to the community/morning walkers. The activity helped us touch 1200+ lives in a short span of 6 days. A BLS training was organized with an NGO – LP4Y ( Live Project for Youth ) on 2nd April 2017. A general HCU was conducted with Kolkata Police ( Wireless Branch ) on 31st March 2017. Total 153 people participated in the activity and made it successful. A presentation on managing Stable Coronary Artery disease - What is New was presented by Dr.Priyam Mukherjee from Fortis at the CME JNM Medical Collge, Kalyani on 30th March 2017. Total 72 doctors participated in the activity. A BLS training was organized with ambulance drivers at TMH Jamshedpur. 21 drivers participated in the activity and made it successful. A presentation on Acute Coronary Syndrome ( ACS ) was presented by Dr.Priyam Mukherjee from Fortis at the CME JNM Medical Collge, Kalyani on 22nd March 2017. Total 113 doctors participated in the activity. Fortis organised a basic health check-up camp for 30 specially abled children at Interlink Calcutta and a talk was conducted by Dr. Sanjay Garg for the parents on the topic ‘Parenting Children with Special Needs’. A general HCU was conducted at Kolkata Police 4th battalion on 16th March 2017 . 138 people got them checked and made it a successful activity. Endeavour by Dept of Emergency Medicine & Paediatric Intensive care, Fortis Hospital, kolkata in association with Society for Emergency Medicine, India & Society for Trauma and Emergency Paediatrics, India. Three Health talks were organized at Reliance Jio, DTDC and HPCL by the corporate team on 8th March 2017 ( Women's Day ). Around 150 women employees participated and made it an successful event. A general HCU was conducted at Oil India on 06th March 2017. 60 people got them checked and made it a successful activity. A Health Talk was conducted at IOCL LBP, Kolkata on 1st March where Dr. P.S.Chowdhury gave lecture on prostate cancer and Dr. Mainak Mukherjee gave training on BLS. A general HCU was conducted at Netaji Subhas Chandra Basu Seba Sadan, Kolkata on 29th January. Total 112 patients attended the camp. A general HCU was conducted at Kolkata Police 5th Battalion on 21st Feb 2017 . 95 people got them checked and made it a successful activity. Fortis Anandapur became the health partner to CAB cricket matches held at CC&FC from 21-26th February where medical support is provided to the players during the match days. A three day HCU was organized for PWC employees on 14th, 15th and 16th at Salt Lake, Kolkata. Sunday Consultation was also promoted so that more corporate leads can be generated. Almost 135 people participated in the activity. A Health talk was organised at DVC, Kolkata on 14th February 2017. Reputed Ortho surgeon Dr. Rakesh Rajputh educated around 130 people on Osteo Arthritis and Pain Management and made it successful. Ambulance and first aid support was given to a quarter final football match which was organized by Bidhannagar Police department on 12th February 2017 at Salt Lake, Kolkata. An HCU was conducted at Oil India, Kolkata on their 56th annual get together on 10th February 2017. Approximately 55 people participated in the activity and made it successful. An awareness program was conducted at BPCL regional headquarters on 09th February 2017 where dietician Mita Shukla educated the retired employees on ‘Lifestyle Management’. Around 42 people participated in the activity. A talk show was organized at Gujrati Manab Samaj, Kolkata on 29th January here Dr. Rakesh Rajput renowned Orthopaedic Surgeon gave Health Talk on Knee Replacement. Total 68 members of the association attended the event and made it successful. Study and Exam Skills workshop was conducted at Heritage School by Dr. Sanjay Garg, Senior Consultant at Fortis Hospital, Anandapur. Total 940 students from class VI, VII & VIII attended the workshop. An organ donation pledge camp was organized at Calcutta National Medical Collage on their 65th reunion. 40 organ donation pledges were signed and 140 Fortis e - journal registrations were done. An Organ Donation awareness camp was organised on Republic Day at Ujjwala Housing Complex near City Centre II at Rajarhat in Kolkata. We reached out to around 50 residents of the RWA with various queries and myths related to Organ Donation. An awareness program was conducted at HPCL on 25th January by Fortis Anandapur where renowned neuro surgeon Dr. Amitabha Chanda educated around 30 employees on Ergonomics. The program was really appreciated by the audiences. On 24th January an Organ Donation stall was displayed at Durgapur Club, Durgapur where SAIL Foundation Day was celebrated and employees all over India participated in the event. An awareness on Organ donation was much appreciated by the people present. A general HCU was conducted Gillander Arbuthnot Co. Ltd, Kolkata. Approximately 85 corporate executives participated in the camp. A general HCU camp for elderly people was conducted at Dum Dum in association with Manikpur Elderly Association.185 elderly people of the association actively participate in the camp and thanked Fortis for the noble initiative. A general HCU was conducted at Kotak Mahindra Bank on Jan 7 and 11 in the following three branches Garia, Kasba & Salt Lake. Total 134 bank executives did their health check-up and appreciated the initiative taken up by Fortis Hospital, Anandapur. Fortis Hospital, Anandapur in association with Rotary Club organised an organ donation awareness camp at Durgapur. More than 400 Rotarians participated in the national district conference where they were informed about the effectiveness and need of Organ Donation in our society. A gynae and pediatric consultation was organized at Airport authority of India on 5 Jan. Almost 51 employees participated in the activity and made it successful. A health awareness program was organized at BPCL ERO on 04 Jan 2017 where a health talk was delivered by dietician Mrs Mita Shukla of our hospital on Food habit and Lifestyle Management. The initiative was really appreciated by the participants. Fortis Hospital, Anandapur conducted Workshop on Study & Exam Skills at St. Francis Xavier’s School. Total 209 students attended the workshop conducted by Dr. Sanjay Garg, Senior Consultant Psychiatrist , Fortis Hospital, Anandapur. A general HCU was conducted for unprivileged children suffering from cancer and HIV organized by India Smile ( an association of IPS and IAS officer, West Bengal Chapter ) at Shivangan, Baguihati. Total Live Touch was 384 and Oragan donation pledge signature was 29. An emergency medical assistance booth was organized on occasion of Christmas Carnival at Sreebhumi which started from 25th Dec and will continue till 1st Jan. Everyday nearly about 100 lives are touched. Till now 43 organ donation pledge form have been signed. A general HCU was conducted on 24th December at Marsheling Housing Society, Kolkata in which 55 people came for the check up. The initiative was really appreciated by the neighborhood society. Fortis Hospital, Anandapur conducted BLS training for employees of Shoppers Stop, Kolkata. 30 people attended the session and it was highly appreciated. HCU camp was organized in Air India where footfall was around 213 and positive patients turned out to be 58. Air India appreciated Fortis Anandapur for conducting such an activity where their employees were really benefited. Health Check Up camp was organized in Wipro Kolkata on 5th December where around there was a gathering of more than 150 people. HCU were done for around 60 people. Really appreciated by the Wipro Team. In the Airtel-Run for Education 2nd Edition 6000 plus runners across the city of Kolkata participated in the Marathon on 27th November. The run started from Slat Lake City Centre. Fortis being the health care partner provided all first aid and any health related support to the runners. Fortis Hospital, Anandapur conducted a health heck-up camp for the Geriatric age group at the Valenkennai Church Campus, Picnic Garden. Free Doctor Consultations were provided to 50 senior citizens along with BP, Blood Sugar and Weight check-up.